PALM SPRINGS, Calif. – Registration for the 2020 California Winter League is now open to all players with college or professional playing experience. The California Winter League offers free agent baseball players the opportunity to play live games for a month in Palm Springs, CA in front of scouts from Major League Baseball and managers from professional independent league teams. These scouts and managers come to Palm Springs every year to be a part of the CWL coaching staff, work with CWL players on a daily basis, and determine which CWL players they will sign before they head off to spring training later in the spring. Every year, around 40% of CWL players receive a contract offer from either an MLB organization or a professional independent team. The CWL began play in 2010 and since then, over 700 players have received offers to go on to play professional baseball following the CWL. This includes players who had just graduated from college the previous spring and were overlooked in the MLB draft. 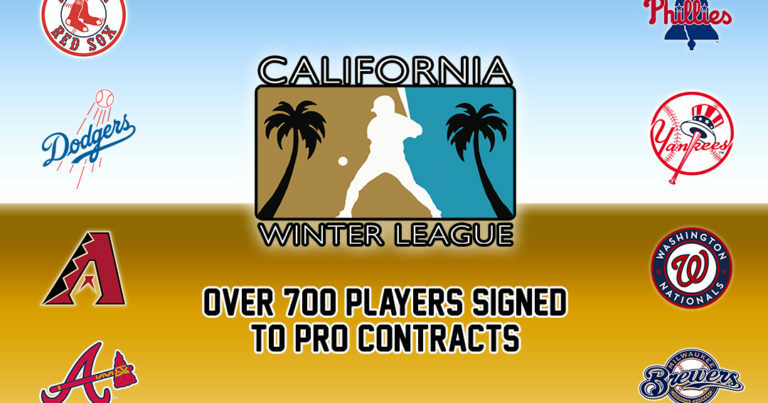 The number also includes players who came to the California Winter League with professional experience already. “We have had players with MLB experience, first round draft picks, independent league players, and international players all come through the CWL and find opportunities to continue and advance their professional careers,” added Reschke. In addition to providing a platform for players from all over the world to prove to scouts and managers that they belong in the professional ranks, the CWL gives players who are already under contract the benefit of training outdoors and seeing live game action before they report to spring training. Players who are under contract with independent league teams join the CWL in order to prepare for their season outdoors while seeing live game action. Plus, they are networking with scouts and coaches who may wish to sign them for their respective organizations down the road. The 2020 California Winter League season will see players report to Palm Springs Stadium on January 20th. The league will feature two MLB workout days, where numerous MLB scouts identify players to follow up with in games later in the month, on January 21st and 22nd. Games will begin on January 23rd, with the CWL Championship Game held on February 16th. Players depart February 17th. The CWL offers a relatively all-inclusive experience for its players as players stay at the Marquis Villas in downtown Palm Springs. The league also includes two meals per day, shuttle transportation, a gym membership to Eos Fitness, clubhouse manager services for things like daily uniform laundry, and an overall professional environment created by the CWL staff. There is no other league in the world that offers the opportunities and amenities to aspiring professional baseball players that the CWL has offered consistently for 10 years. For information on how to join the California Winter League and everything that is included, Click Here or call the CWL offices at (760) 778-4487.